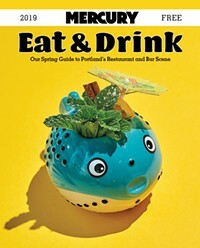 Welcome to the Mercury’s Fall Eat & Drink Guide! Welcome to the Neighborhood, Cafés! One of Portland’s premiere venues now has a beer of its own. Green Room was brewed by Culmination Brewing for the Doug Fir Lounge, and I get the impression that it’s meant to replicate a 16-ounce Tecate with lime—only this time, the lime’s built into the beer itself. The tallboy comes with four different colored labels that feature posters from Doug Fir shows and a quote from the Ramones’ “Blitzkrieg Bop.” You’re likely meant to drink it directly from the can, but if you do pour it into a glass, it pours a muddy gold color, like Agamemnon’s mask (not green at all). The head dissipates almost immediately, with a strong aroma of lime. It’s a super drinkable if slightly vacant beer with a tart citrus bite, a little metal-flavored twinge, and a sweet malt finish. Making its return to cans, Peach Punch! is an almost ludicrously peach-dominated beer whose juiciness does wonders to offset any unseasonable heat. It pours a matte ochre color, completely impenetrable to light, with a frothy head that subsides to a lacy wisp. While there’s surprisingly little odor, there’s a strong flavor of peaches and apricots (obviously) from the get-go, tempered by bitterness from Galaxy and Mosaic hops. The mouthfeel is plump with a slight yeasty grit, and the flavor really is a bit crazy, with notes of baby food, tart Asian pear, summer orchards, and citrus. Now in cans to mark the opening of Migration’s Gresham operation, the Portland-area brewery’s flagship Patio Pale is an assertive, hoppy concoction that ventures onto IPA’s side of the tracks. It’s a tangy, slightly bitter beer that pours from the can an unfiltered, muddy bronze with a small head. The mouthfeel is buzzy, with some gentle honey sweetness, bitter herbal hop flavors, and strong notes of evergreen. It’s pretty enjoyable, although there’s a slight dirtiness to the flavor that might put off lager-leaners. Wolves and People’s newest canned offering is a real delight, a slightly wacked-out IPA made with linden blossoms—no, I don’t know what those are either, but they lend the beer light components of lemon and tea. El Verso pours a waxy honey color, with a moderate head that lingers, and a pleasantly musty aroma with strong hints of butterscotch. The soft, fizzy mouthfeel accompanies an all-encompassing flavor that blends sweet, sour, bitter, and even salty in a fascinating way. It’s not a background beer, but it’s fruity, gentle, and fun. This is the perfect thing to be drinking as summer ever-so slowly fades. This hazy double IPA—part of Stickmen’s “Cloudy” series, each featuring a different hop—pours a deep, plum-tinged copper. It’s a stormy-looking, opaque beer with lots of suspended yeast and a firm, well-proportioned head. Despite its ultra strength, Cloudy manages to be well balanced, with citric hop flavors and notes of strawberry Starburst. The piney, face-tingling heat after you swallow is the only hint that this one’s got a lot of booze in it. It’s a thick, enjoyably aggressive beer—although at the end of a 16-ounce can, it eventually wears out its welcome.